Miniature gardens encased in glass, terrariums are an elegant way to bring snippets of low-maintenance nature indoors. 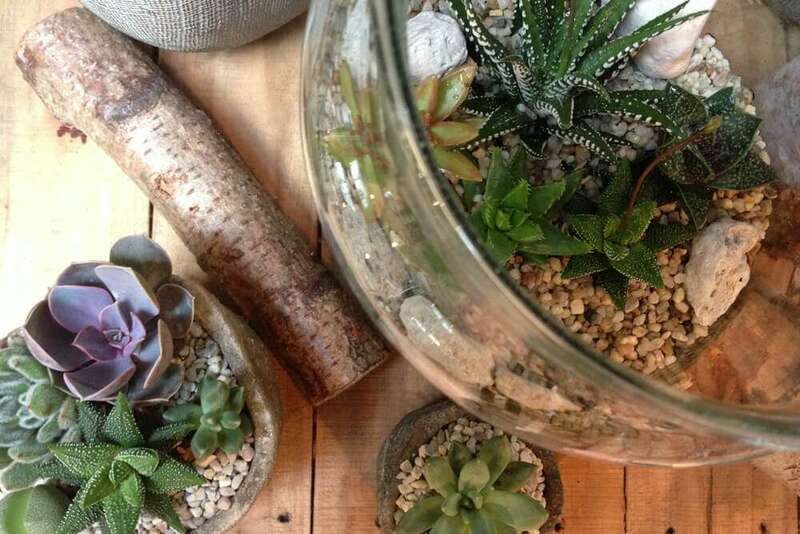 Assembling a terrarium is fun and rewarding, making it the perfect weekend project. Fill your terrarium with as much or as little as you wish. Beware, the more you put in the more quickly it will become crowded. However, too few plants will not look as good! Decide if you want a moist or dry terrarium – plants such as succulents and cacti require a drier environment, tropical plants and ferns require a more moist environment. Carnivorous plants can also make a great subject for an open glass container and air plants require no soil at all, just a weekly spray of tepid water and a bright semi-sunny position. You may want to add decorative gravel, drift wood, shells and moss to create a natural atmosphere. Tropical plants are available for terrariums, although you might want to plant quicker growing species as you can then change the terrariums more often. Cacti will grow slowly but will require a very light position. • Certain varieties of carnivorous plants: Nepenthes will do well in a large closed terrarium but Sarracenia and venus fly traps are better in an open-top terrarium. • Cacti and succulents – these are great for open-top terrariums but not closed ones. 1. Start by making sure that your terrarium is clean, to allow maximum light to get through to your plants. If you are re-planting a new display, wash out any old soil to stop contamination from fungus and disease. 2. Now add gravel – a couple of centimetres deep should be enough. 4. If you are planting a moist terrarium you can add a thin layer of activated charcoal to keep the interior of the terrarium ‘sweet’ or to stop it smelling stagnant, but this is not essential. 5. If you can fit your hand inside your terrarium you can add the compost easily. Remove the plant from its plastic pot and make a hole deep enough to take the whole of the plant’s root ball. Then add compost so that the roots are covered with soil. If you can’t get your hand inside you can make mini terrarium tools by adding small sticks to eating forks to extend the handles. You can then reach inside easily to plant. You can use toast tongs for deep containers and prickly cacti. 6. Once planted, lightly water to settle the plants in. 7. Finally, wipe any dirt off the sides of your terrarium. You can then think about adding some more interest to your miniature garden. Add moss, fossils, rocks, driftwood, shells, skulls or even little figurines (great for children!). Natural items like driftwood can give a forest-like effect. For a vintage look, position reclaimed items such as old bottles or books next to your terrarium. For something more modern, keep everything clean and simple – less is most definitely more. A closed terrarium will recycle its own moisture, so will need only occasional watering. Too much condensation on the glass may mean you need to let the garden dry out a little bit, while no condensation might mean you have to add a little more water. If your terrarium is open you will have to water more frequently. Keep the soil moist, unless you are growing cacti and succulents, which prefer a little drying out between watering. Mist air plants weekly during spring and summer, but a little less in colder months. A soak in a bowl of tepid water once a fortnight for a few hours would also benefit your air plants. Leave to drain before placing back in the terrarium. Feeding your terrarium is not usually necessary. Position your terrarium in a warm and bright position out of direct sunlight (unless it contains cacti, succulents or air plants which will tolerate full sun). To pick up your supplies simply head down to the garden centre, where a member of staff will also be on hand for any further assistance. Good luck and enjoy building your terrarium!